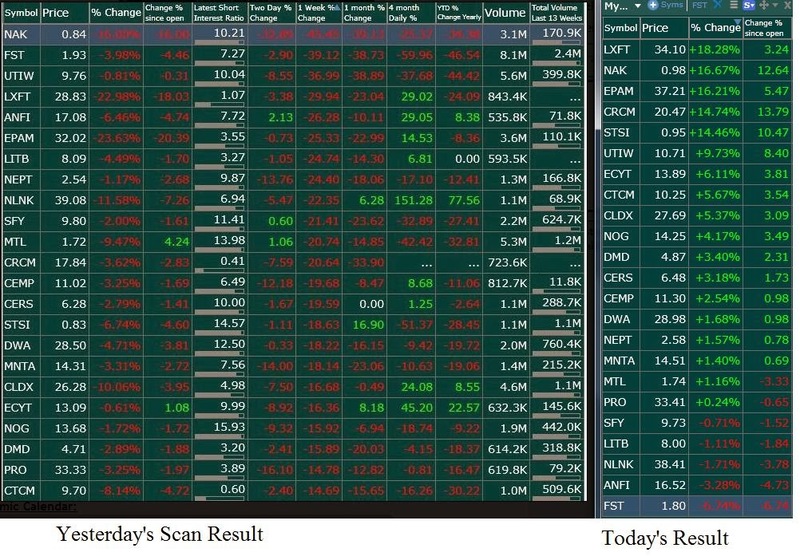 Below is the comparison of yesterday's bottom scan result with Today. CRCM, LXFT, NAK, STSI, UTIW, while FST was big loser. Evaluation of Yesterday's Bottom Scan Result. "Which Forex pair and time frame is best to trade" is the frequently asked question and I want do give you the DEFINITE ANSWER. Are you expecting that I am going to say something like EUR/USD on 5-minute time frame or GBP/USD on daily...? No, it is not so simple, but SIMPLE ENOUGH we can figure it out! The "PROBLEM" is that markets change over time. If GBP/USD was a well trending currency pair a few years ago, today it is another one. I actually want to let you know about a SPECIAL TOOL that I use to find the BEST TRENDING PAIRS among all the Forex pairs. The software scans 34 Forex pairs on all time frames from minute to monthly. This way you pick the best trending pair and time frame at the current time.